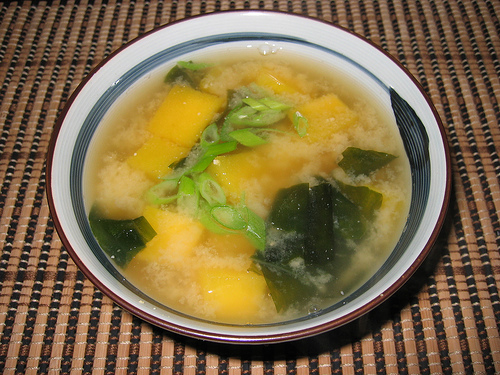 The farmers market has been full of fresh local squash and I wanted to use them in a miso soup. I have cooked with butternut squash before so I decided to start with that one. Normally one would simmer squash in the dashi until it was tender but I really like the flavour that oven roasting a butternut squash adds. I have miso soup for breakfast so I do not have much time to spend on making breakfast before I dash off to work. I had to do a little experimentation until I got it just right. As soon as I woke up I cut off a slice of butternut squash and placed it in the oven. That gave me about 30 to 40 minutes until I needed to eat breakfast so that I could leave for work on time. At first I cut the slices 1/2 inch thick and although the squash was tender enough to eat it did not have the most flavour. By the end of the week I was cutting two 1/4 inch thick slices and they came out super tender and full of flavour. They were so tender that you could easily mash them with a fork with little or no effort. Just they way I like my oven roasted butternut squash! The slightly sweet melt in your mouth squash went really well with the saltiness of the miso to make a really tasty soup. Other than the possibly high salt content of the miso this soup is pretty healthy as well. Bake the butternut squash in a preheated 400F/200C oven for about really render, about 30-40 minutes. Cut the butternut squash into bite sized pieces. Bring the dashi, butternut squash and wakame to a boil in a small sauce pan. Reduce the heat and simmer until the wakame is tender. Kevin, that looks good. Does soup keep you full all the way until lunch? I’d like to try something like this for breakfast. Hmmm, I love miso soup, never had it with butternut squash. I will have to give it a try.